Under Dow theory, we are not confirming a higher [continuing] bull market. The ECB, after threatening to do whatever it takes, does nothing. Bernanke sat on his hands yesterday, Knight Capital blows itself up with “fat finger” trades, and the market trades lower. If it wasn’t already glaringly obvious, trading short time frames, viz. noise, is difficult. Of course we all try it. A longer term methodology, not the one that I actually use, but one that I have looked at, viz. 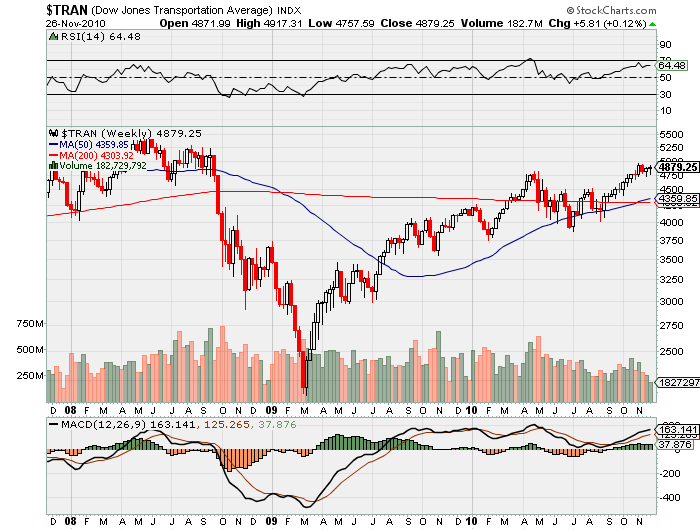 Dow Theory, has an interesting take today. 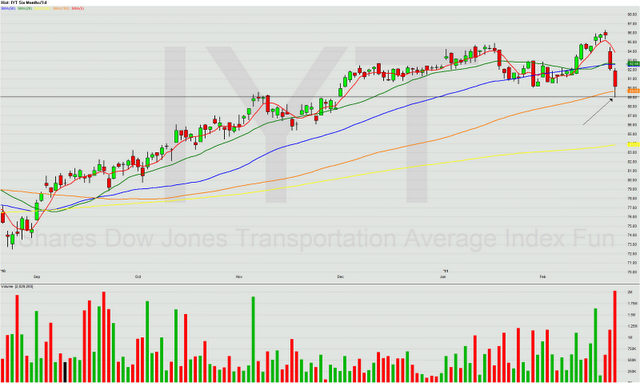 Which is taking one component of the “Transports” truckers, out of the aggregate of transports, rails, air and anything else that constitutes transport, which is used to confirm/reject the Industrials in the analysis. 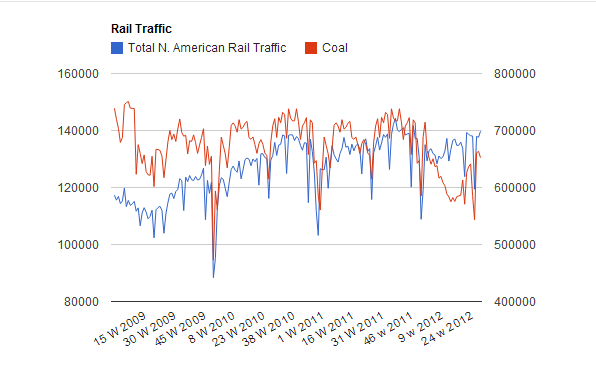 Take the “rails” data which contradicts the truckers data, and, you see the benefits of combining the transports into an aggregate chart. 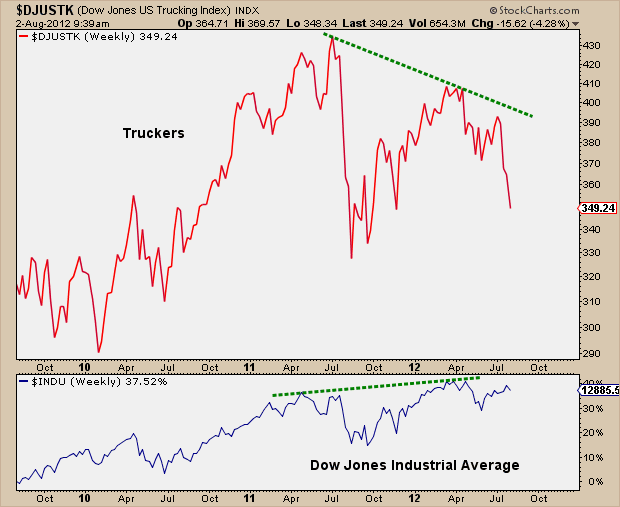 Essentially then, Truckers have already broken recent support, while the $TRAN still holds above that area. 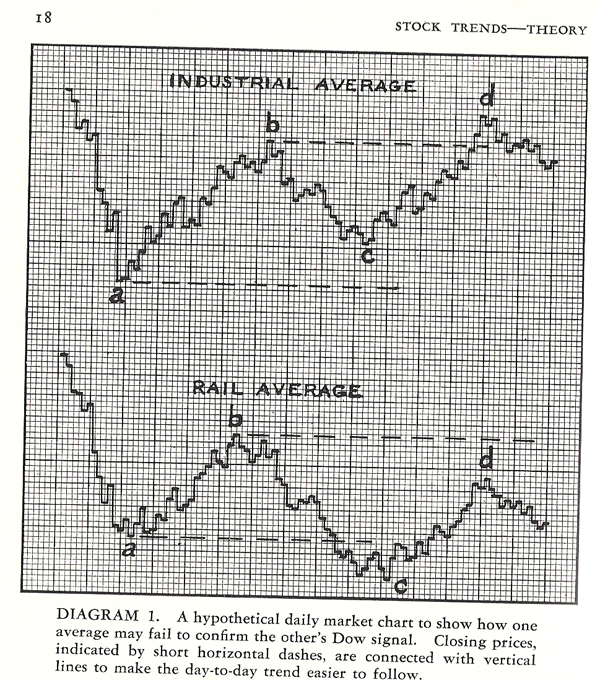 The whole idea of Dow Theory, is to use the chart in aggregate, not to start examining individual components. Transport to the industrials, back in the day would indicate supply of raw material in, supply of products out, without actually getting into the fundamentals or economics, a lazy man approach, but as effective as anything else. As it stands, there is/was no confirmation from the transports, to the industrials, that a breakout higher was particularly imminent. 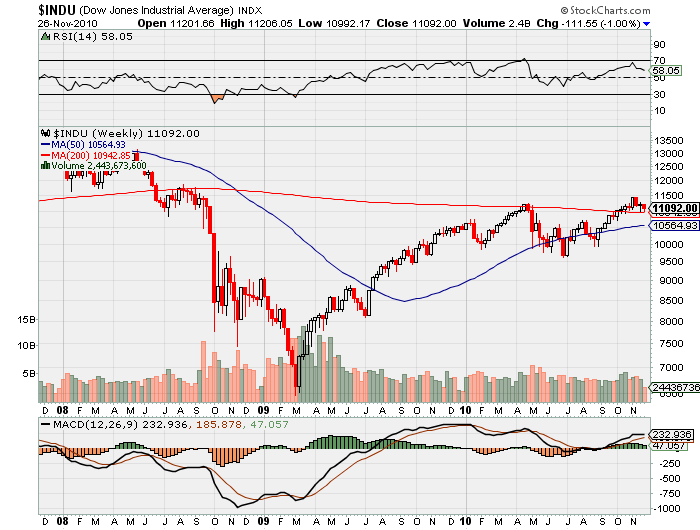 Remember back in time, the Russell call of a new Bull market based on Dow Theory? This is not a science, this is an art. So the theory states that this then is not as yet confirmed as a Bull market. I always get a kick out of reading how history repeats itself and this empirical historical data validates one’s view point today. Here is my viewpoint. Whatever happened in the past doesn’t mean squat in this new paradigm . Look at the 50 year S& P chart, look at when computers started trading. Now ask yourself what is the stock market … a vehicle for companies to raise cash to support growth and innovation. I don’t think so my naive pal . Its a mechanism to extract as much money from the economy as it can with HFT, CDO’s and all means of smoke and mirrors so excuse me when I laugh in the face of a anachronism such as yourself . I’m an early adopter and I get it…all things flawed rule and your charting was not flawed in previous paradigms therefore cannot rule now.. Nice try though. Brad, it’s a game of risk and probabilities, that’s all. Your comment shows that you don’t understand the post or don’t trade often. The post doesn’t try to take a 1920′s theory and fit it to today. It uses the theory to allow a trader to access risk and trade based upon that information. ‘Theory’. Implies that the premises are derived, or deduced from an axiom. The resulting premises if logically consistent, then have to be true, each deduction leading to more complex and less obvious truths. Mathematics is the classic example. A ‘hypothesis’ however is a premise, made through observations, and then holding other variables constant, repeatedly testing that premise. ‘Dow Theory’ is no theory at all, it is a ‘hypothesis’ and as such falls towards Popper’s observation, assumed true until proven false, of which you only need 1 example. If then there is an example of ‘Dow Theory’ non-confirmation within the history of the two averages, the ‘hypothesis’ fails. It was only a few days ago that I mentioned how the Transports had moved back into confirmation: too soon obviously. 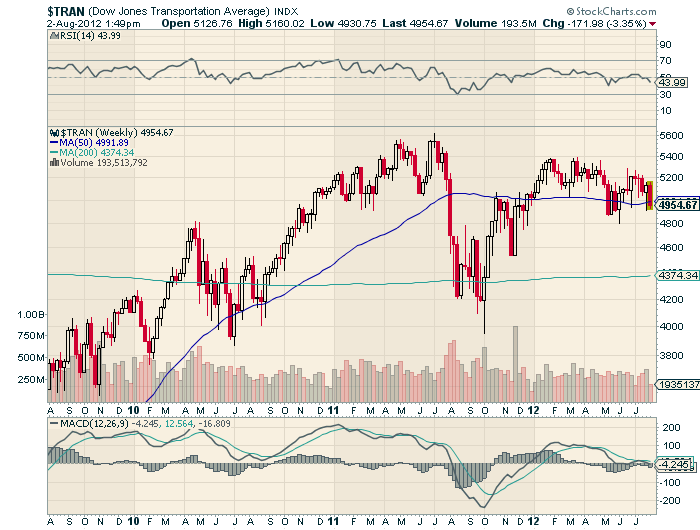 The Transports have taken a hit, and are looking none to healthy currently. Possibly the impact of higher oil prices, to which they are particularly vulnerable. Without a doubt however, the indices are stretched via QEII, and there is difficulty in rationally buying stocks with pullbacks at the forefront of peoples minds. 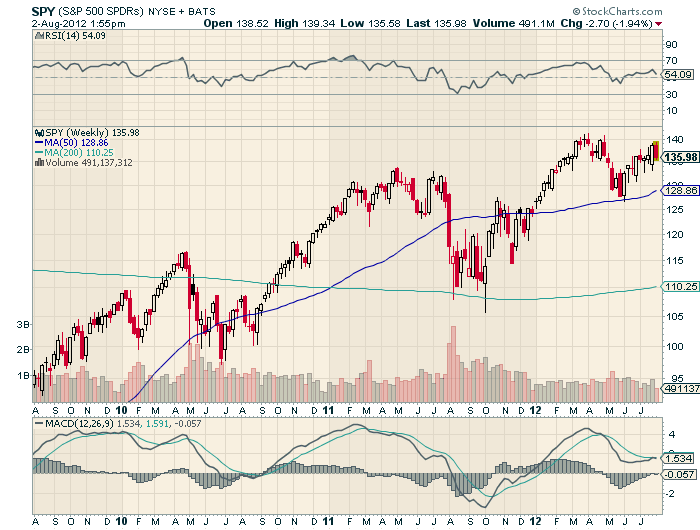 However, until everything rolls over, you have to continue buying the dips, nervy as it is. 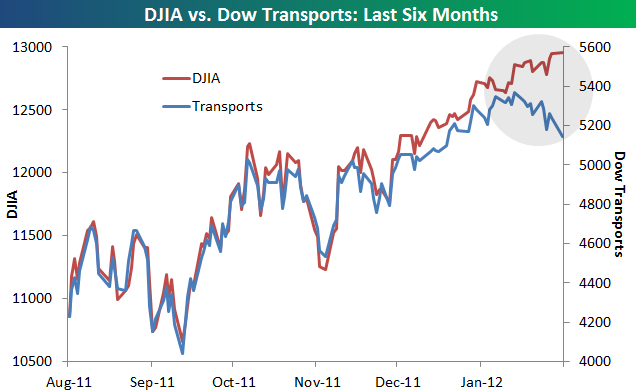 Again the Transports are leading the Industrials. They are however still moving in the same general direction. 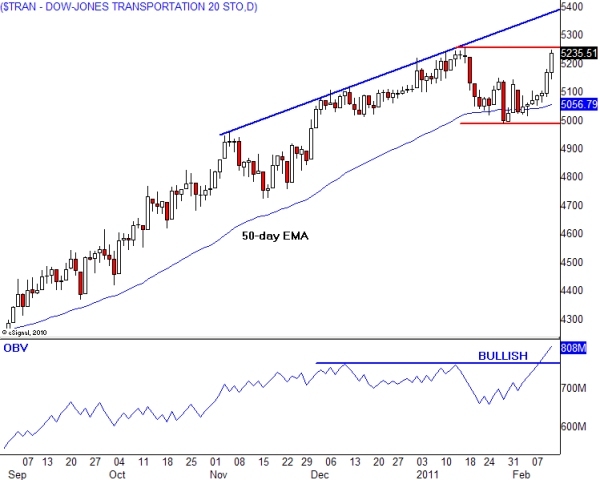 The Transports have also reached a resistance area. If a true recovery is underway, we will need to see both averages break through this resistance area and continue to the final resistance area, and finally to new highs.